Kate Nasser graduated from college with the goal of being a high school math teacher. After three months of teaching she was hit with a meatball and realized this was not what she wanted to do with her life. Needing to support herself she found a few jobs in computers and was miserable. A friend suggested that she see a career counselor. Listen to Kate tell her story of how she got over her career hump and what that counselor told her that changed her life. Kate Nasser felt leadership within her as early as kindergarten. She befriended a heavy set little girl in her class that others were bullying. They stopped making fun of the little girl and started to include her and play with her. Kate at age 5 didn’t know that what she did was leadership yet this desire to help others with her strength was always there. She was the youngest of four daughters and had to hold her own. The inner strength kept pulsing and was turning her into what she is today. The challenge was getting comfortable with her strength and living it without overwhelming others. The journey wasn’t smooth. There were people in college and early job days who shunned her. It was lesson after lesson in becoming comfortable with herself even when it meant being alone. It taught her many different avenues for solving problems, overcoming challenges, and building connections. Graduate school for Masters in Organizational Psychology was another set of lessons learned from the interactions in the classroom. 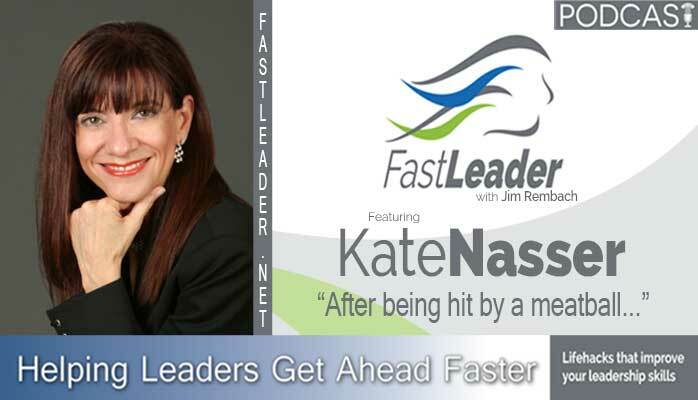 Ultimately all these lessons and Kate’s strength spelled her destiny of self-employment as The People Skills Coach™ for leadership, teamwork, customer service, and employee engagement. The underlying message of all her work is: Interact and lead with courage AND balance. Achievement is not the big challenge. Balance is! Her blog posts often take on the challenge of balance in leadership as do her workshops. She is working on her first book about quickly spotting and adapting to personality types without losing your sense of self. Very powerful tool for success and happiness. Kate has also created a forum for others to discuss, share, and learn about strength, balance, and interactions. It is the #Peopleskills global Twitter chat Sundays 10amET and associated 24×7 online community. She also wanted to readdress the issue of bullying and the chat features an online #Stopbullying rally once a quarter. Kate Nasser graduated from college with the goal of being a high school math teacher. After three months of teaching she was hit with a meatball and realized this was not what she wanted to do with her life. Needing to support herself Kate found a few jobs in computers and finally was hired by a large pharmaceutical company and was totally miserable. A friend suggested that she see a career counselor. What the counselor told Kate was a total shock. Listen to Kate tell her story of how she got over her career hump and what that counselor told her that changed her life. Inspire people, don’t overwhelm them. Inner strength and inner talent. Jim, Your series of FastLeader podcasts is testament both to your insight AND the power of the WEB. 27 years ago I could not have gained so much practical life experience from leaders in one place and time. This podcast is a great contribution to real life on the spot learning. I will continue to listen to all your podcasts and the different leaders you are interviewing. Such wisdom. Such openness. Such generosity of life experience. Thank you for including me in this pathway to learning. It was an honor to share my lessons learned from a long and tough journey. I invite all who listen to this conversation between us to share their views and let me know what I can learn from their perspectives on my journey. Kate, It was a honor having you on the show. Thanks for sharing your stories and being part of the Fast Leader Legion.